Hello, strangers. First of all, in case you missed the word, I have decided to try what the kids are calling "Twitter." This is something that happens on the Internets and apparently gives me yet another outlet to over-share about my life and tell you exactly what I'm doing at all times. I have already received 5 emails from a friend who insists that I'm doing it wrong. It's been a rough go so far. But if you feel so inclined, please join the crew over there. You are also welcome to like Stranger on Facebook as well, which is somehow different than Twitter. Or so I'm told. Our plane landed on the big island in Palau last night a little after midnight. This was after a few other horrific customer service experiences with United Airlines, the details of which I won't bore you with you now. Rest assured, United Airlines is not interested in repeat customers in this part of the world. To get home from the airport, we have to drive across a couple of different islands. 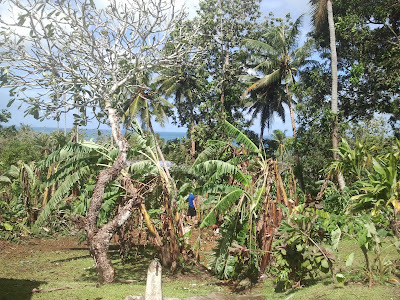 Fortunately since the typhoon mostly missed Palau, the bridges and causeways connecting the islands were basically unharmed. 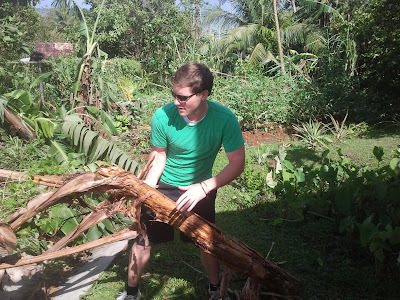 Yet, incredibly heavy winds and rains still plowed through the country and left a mark. It was very ominous driving through Palau in the dark last night, surveying the damage of a now quiet scene that wasn't so quiet just a few hours before. 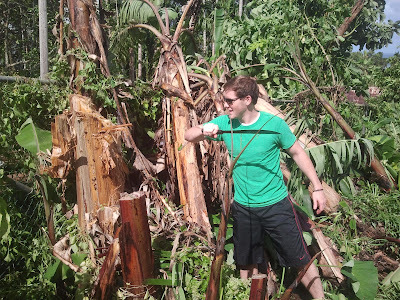 The power was still out across most of the country we saw and pieces of untamed jungle covered the roads, causing us to weave back and forth to dodge collisions. Our apartment was secure and sustained no real damage in the storm. Before we left we had pulled almost everything from our balcony into the apartment to protect it from the incoming storm. I say "almost everything" because there was one thing we decidedly left outside and secretly hoped would be blown away in the storm. A garbage can that had just become the nesting spot for a bunch of maggots. We had planned to do something about it before leaving but it gave way to more important things. Like taking naps and watching Jan Terri videos on Youtube. We left a key with our well-meaning neighbor who, very unfortunately, pulled the bin into our apartment yesterday just before the storm hit. Pandemonium struck when we opened the apartment door and saw it inside. Things were said. Feelings were hurt. Dreams were shattered. It wasn't until the morning that we saw the extent to which the winds pillaged the surrounding landscape. A large hill that neighbors the one we live on and is usually covered in dense jungle looks now like it has been poorly shaved with hair clippers. It reminds me of a haircut I gave my little sister when I was six and successfully convinced her to tell Bob and Cathie that she did it herself. One that, still, to this day, she has not thanked me for. I got a text from a co-worker this morning just after I walked out the door to head to work that the courthouse would be closed today while maintenance cleaned up the area. 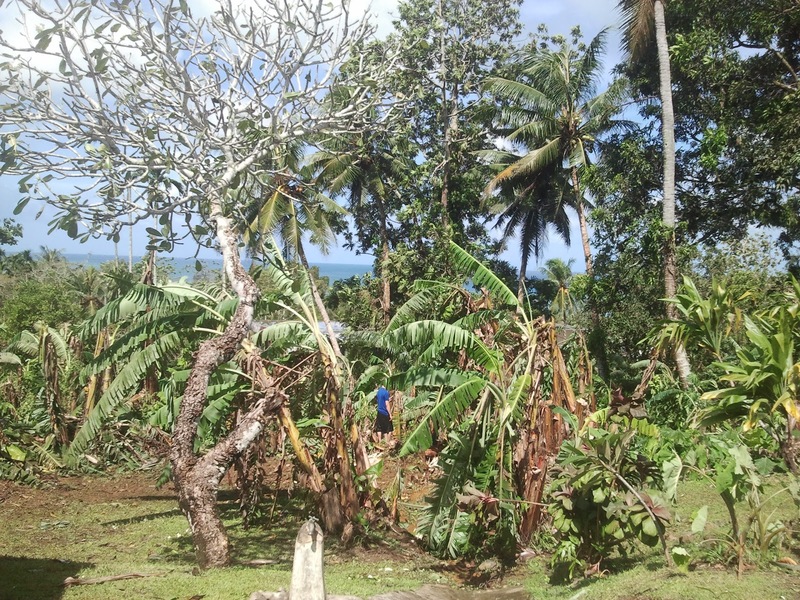 We also got word that some fellow church members were trying to clean up the Mormon church grounds from the storm, as well as help at a few houses that had been badly damaged. The church building has an incredible little garden behind it with lush tropical fruit trees and bushes. It looks like Jurassic Park back there. But with way fewer people getting eaten. We showed up to lend a hand and were thoroughly covered in mud from head to toe within 5 minutes. A torrential rain storm that blew through during the cleanup washed our mud away momentarily, but within a few more minutes, we had a gained a new layer. You know what the best way to spend your surprise day off is? 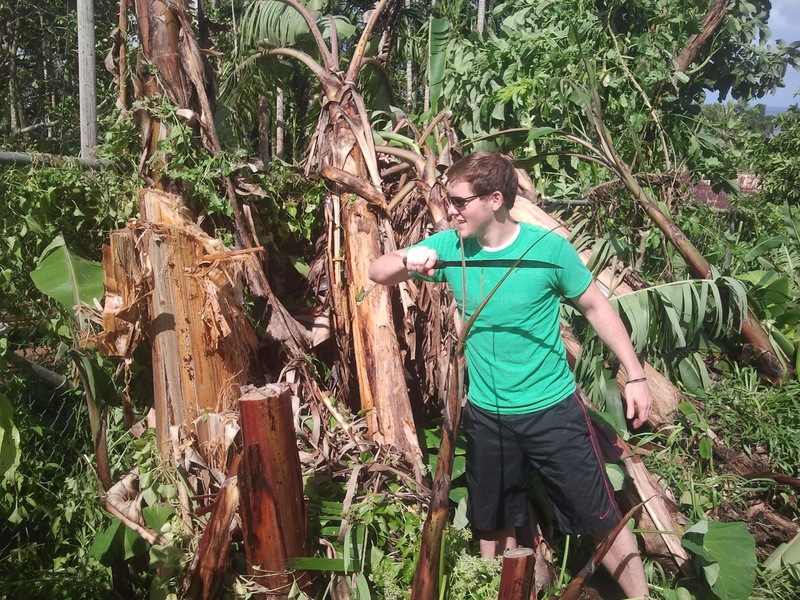 Chopping down banana trees with a machete after a typhoon. You know what the worst was to spend your surprise day off is? Repeatedly slipping on a muddy hill and sliding to the bottom with the wind knocked out of you while holding onto a wheel barrel that is now shedding all of the tree limbs and leaves you worked so hard to stack inside of it. So, it was a wash.
Now I'm in travel/machete/it's too hot and I live on a tropical island recovery, resting at home to the sounds of Christmas music, which is making me miss decorating for Christmas with Cathie like I try to do most every year. But I can't rest too well as we now seem to have a fly infestation. Daniel, hacking into a coconut with a machete. 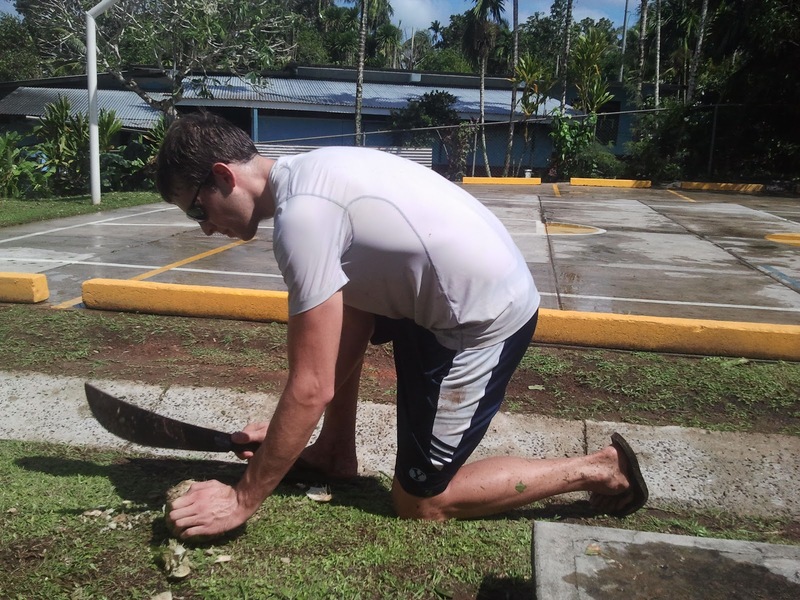 Eli McCann, improperly holding a machete. Almost losing his life. 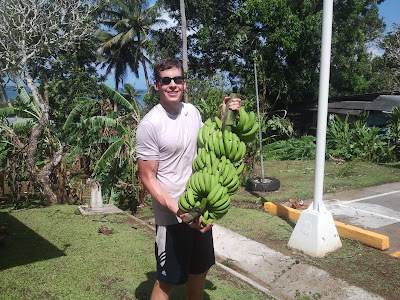 Daniel, going bananas! (Ugh. I hate myself for writing that). This is what remains of the previously VERY dense and lush jungle-garden. Now we can see through it to the water. It's very sad. But the view is nice. Twitter is my most favorite thing on the Internets. Let there be more tweets! SO, if that's how bad you guys got hit, what happened to the other islands that actually got hit by the storm? Me, too. Motion is on the floor. Is there a vote? The things I take for granted living in California. We never get hit with storms even remotely sort of close to that. Also, welcome to the twitterverse. Just a bit of a heads up - I think your neighbour may actually hate you. Do NOT give him your keys ever again. And never turn your back on him. Louis CK was shunned by the public for following only one person.... I'm just helping here...I don't judge. However this may be a genius move. He has almost 3 million followers. Diabolical my friend. Ugh! He brought your maggot-infested garbage can inside? I can't even think about it, Eli. Not gonna do it. 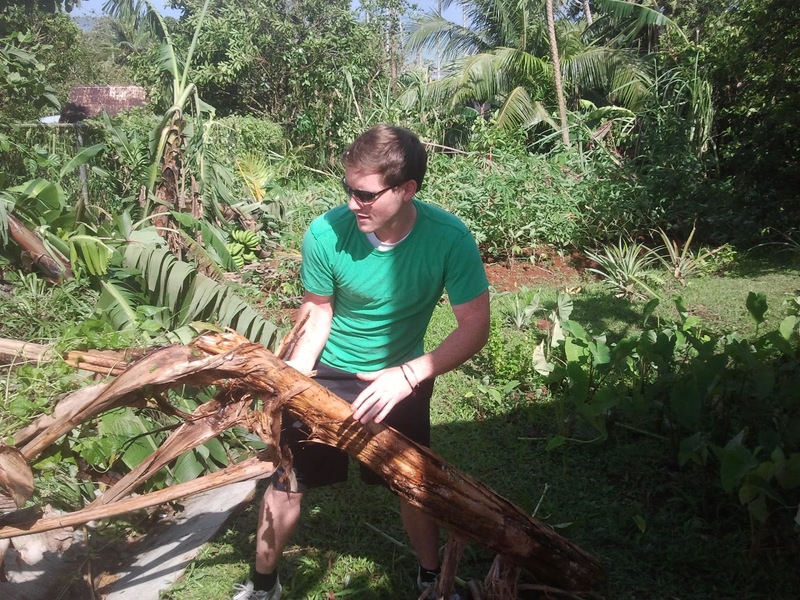 Keeping the Philippines in my close prayers. Your neighbor deserves an award. what is the address and i will make a medal! I would love to be one of the flies (from your house) on the walls during your sacrament meeting just to see how a branch this small operates! The smallest branch I have attended was 27 people (which happens to be my favorite number so it was a memorable experience).